Fall-ify your soup with this awesome recipe. 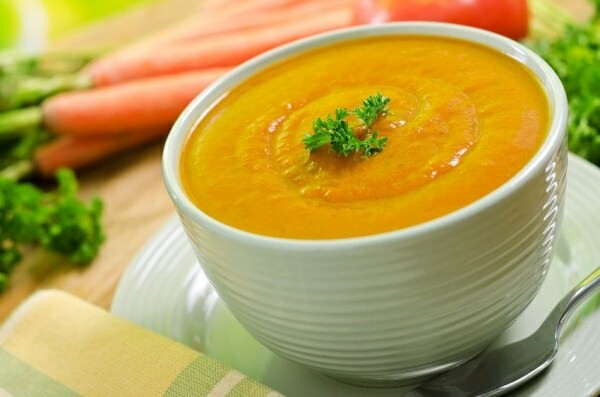 Carrot and pumpkin have many health benefits. They are chock-full with vitamins and minerals that your body needs. Consuming pumpkin and carrots during the cold season is a surefire way to keep your immune system strong and your tummy happy. Preheat oven to 350°F. Place pumpkin, onion, and carrot on a baking sheet. Sprinkle with oil, pepper and salt and put in the oven. Bake for 20 minutes or until a bit caramelized. Place your caramelized vegetables in a large pan with the stock, bring to boil and simmer for 20-25 minutes. Blend your soup until smooth.